The flared jeans are inspired from the hippie movement in the 70s; they are the types of fashion items that look amazing despite the type of body. What’s best about the flared jeans is the fact that the runway shows have been starting to show flared jeans in the following season, so here are a few tips on how, why and when to wear these amazing fashion items. Always make sure that the flare of your jeans is an appropriate one, as you don’t want to exaggerate when it comes to this part. 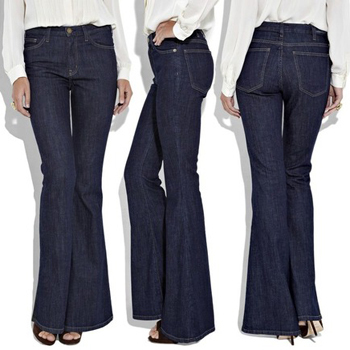 Even if they are flared jeans, the extreme flares are definitely not flattering. So make sure that you measure that part before you buy them. These types of jeans are amazing for women who have narrow hips and those who are taller and want to look more petite. However, if you are short, you should avoid this type of jeans or at least try to keep the flares to a minimum, because they tend to make women appear shorter and you definitely don’t want that. The great thing about flared jeans is the fact that they can be combined with any types of shoes; there are absolutely no limitations when it comes to shoes. They work great with wedges, stilettoes, sports shoes, flat shoes, sandals, etc. This is one of the reasons why anybody should have a pair of flared jeans in their wardrobe. If you want to go for a cute 70s look, get some peachy makeup, a lot of mascara and some wedges with your flared jeans. These jeans also work amazing for women who want to balance their body shape and have skinny legs. They make your legs a little bigger and you will manage to achieve symmetry between the upper part of your body and your legs. If you get the chance, always buy two pairs of flared jeans, one that is washed because you may want to have a casual urban look and another one that is simple and has a darker color for those days when you want to go casual-elegant. This entry was posted on at and is filed under Style. You can follow any responses to this entry through the RSS 2.0 feed. You can skip to the end and leave a response. Pinging is currently not allowed.